Cartography in the United States was published in 2015 by the University of Chicago Press. Edited by Mark Monmonier, Volume Six is a two-book set that includes 529 entries, written by over three hundred contributors and co-contributors, and 1,153 illustrations, 5,115 bibliographic references, and 61 tables. It is also available as an e-book. 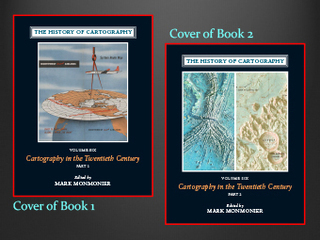 When complete in 2021 or 2022, the History of Cartography will consist of six volumes spread over twelve bound books. Although Volume Six is the most recent installment of a series conceived by David Woodward and Brian Harley in 1977, it is not the final volume. Volume Four, covering the European Enlightenment and edited by Matthew Edney and Mary Pedley, should appear in 2019, and Volume Five, edited by Roger Kain, is slated for publication in 2021 or 2022. Volumes Four and Five, like Volume Six, are organized as encyclopedias. Big book histories like these not uncommonly appear out of sequence. What David and Brian had in mind in the 1970s did not include the twentieth century, which they added after Walter Ristow, one of their advisors, argued that an end date of 1900 would ignore cartography’s most creative and productive century. In December 1984 Mark Monmonier was invited onboard as unofficial editor of the twentieth century volume. By then it was apparent that the History Project would extend well beyond the originally planned publication date of 1992. Mark’s role became official in 1996, when the Press appointed him co-editor of Volume Six. In October 1997, he and David convened a three-day planning conference at the Library of Congress. Funding from the National Endowment for the Humanities allowed us to invite thirty-four scholars, including three from Britain, two from Canada, and one from The Netherlands. The biggest and most consistent supporter of Volume Six has been the National Science Foundation. After their first proposal was rejected because of high cost and mixed reviews, David and Mark proposed the Exploratory Essays Initiative, a three-year grant to recruit a small number of proven or promising scholars interested in mapmaking or map use, and to mentor them through individual 10,000-word essays on some aspect of map history. Ten participants, they figured, would move Volume Six a tenth of the way closer to a million words. After Volume Three ran to 1.3 million words, the Press had set a million-word limit on the three remaining volumes. The exploratory essays became a special issue of Cartography and Geographic Information Science in July 2002. A five-year NSF grant soon followed. By that time it had become apparent that the long-essays approach used for previous volumes would not work for the European Enlightenment, to be covered in Volume Four, and surely not for the twentieth century. By contrast, an encyclopedia would allow the editors to involve a multitude of experts as well as control each volume’s size. Instead of forty or so individual chapters, the table of contents became a list of several hundred encyclopedia entries. The encyclopedic strategy was adopted several years before David’s death in August 2004. David and Mark had planned to develop Volume Six as coeditors, working in coordination with the coeditors of Volume Four. After David’s death, Mark became the sole editor of Volume Six, and Matthew Edney took on the added role of project director, responsible for the Project office in Madison. The project's mentor at the Press, Linda Halvorson, who had worked on encyclopedias at Oxford University Press, suggested a system called “hierarchically integrated conceptual clusters,” or HICCs. This strategy was conveniently anchored by the nine modes of mapping practice and four multi-modal institutions discerned by Matthew for the Enlightenment. The twentieth century required two additional modes, Overhead Imaging and Dynamic Cartography, and one additional multimodal institution, Academic Cartography. This schema led to twenty-six conceptual clusters, which provided a framework for over five hundred entry titles, fleshed out with the help of Linda, Matthew, Mary, and the History Project’s managing editor Jude Leimer, and with the further assistance of an international board of thirty-five distinguished advisors, recruited from ten countries and more than a dozen subdisciplines. A second five-year NSF grant allowed Mark to expedite completion by hiring four associate editors: Karen Cook, Joel Morrison, Peter Collier, and Jon Kimerling. During the final years of work on Volume Six Claudia Asch provided invaluable support as the research assistant in the Syracuse office. University of Chicago Press, 2015.